Australian Government geospatial science leaders have abandoned the decade-long Virtual Australia project to build a national environmental simulations system. 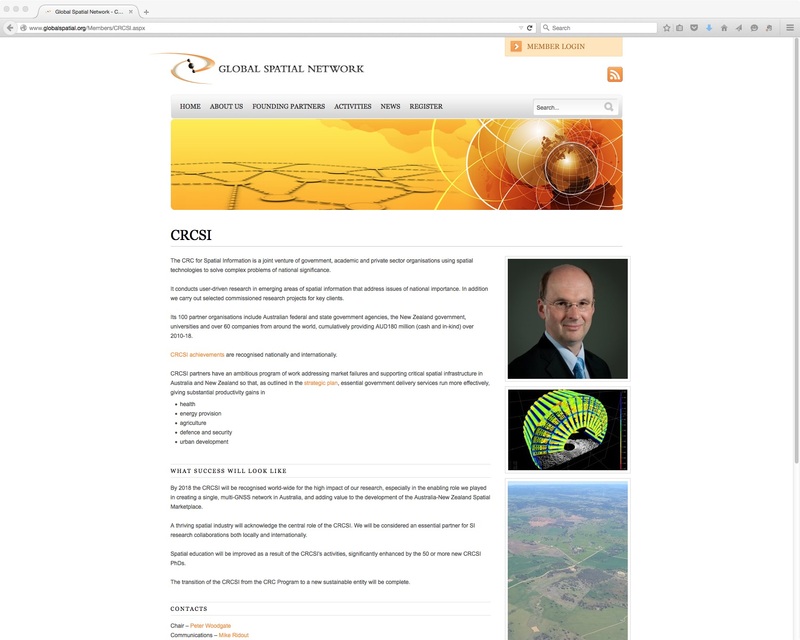 Initially proposed in a 2005 report by Victorian supporters of the University of Melbourne-based Co-operative Research Centre for Spatial Information (CRC-SI), the Virtual Australia vision grew to include the CRC-SI’s second funding bid in 2010, and a satellite research centre in New Zealand (report here). Now it has emerged that the CRC-SI’s subsidiary company, set up in July 2011 to ‘broker’ widespread trans-Tasman support for the vision, was legally deregistered in late 2013 – without the knowledge of most supporters and partner organisations. Secrecy has cloaked key increments of the CRC-SI’s Virtual Australia and New Zealand Initiative (VANZI), since it was soft-launched at several CRC-SI workshops in 2010. Dr Peter Woodgate, CEO of the CRC Spatial Information, still claims to chair the deregistered VANZI Ltd. In July 2011, the CRC-SI supported legal registration of a not-for-profit company, VANZI Ltd, with Melbourne logistics businessman Michael Haines as its CEO and the CRC-SI’s CEO, Dr Peter Woodgate, as Chair. They are still publicly claiming these roles. They have not clarified – even to leaders of some key partner organisations, including the Spatial Industries Business Association and the organisers of the 2013 and 2014 VANZI conferences – that they cancelled the VANZI Ltd business name on 22 October 2013 and deregistered the VANZI Ltd company (effective with the Australian Securities and Investments Commission) on 1 January 2014 (ABR cancellation certificate here, ASIC deregistration certificate here, ASIC-registered directors of VANZI Ltd here. VANZI was celebrated at the 2011-2013 spatial@gov conferences, which were sponsored first by the Commonwealth’s former Office of Spatial Data Management (OSDM), then its replacement Office of Spatial Policy (OSP) – and by ANZLIC, the trans-Tasman council of state and national government leaders of spatial information departments. 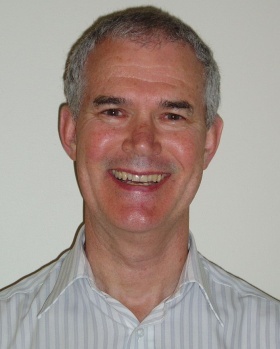 Championing both the CRC-SI and VANZI was Drew Clarke, current Secretary of Australia’s Department of Communications, (including the OSP) and chair of ANZLIC until June 2015. However in 2013, the OSP (managed under Clarke by Helen Owens) began a gradual process of withdrawing Government support for VANZI. It rescheduled its annual government spatial conference (normally in November) to seem to conflict with announced timing of the first VANZI conference in Sydney in early 2013, and it has not included VANZI presentations at its later government spatial conferences (now called Locate). The Abbott Coalition Government was elected in September 2013, with Malcolm Turnbull as Minister of Communications. 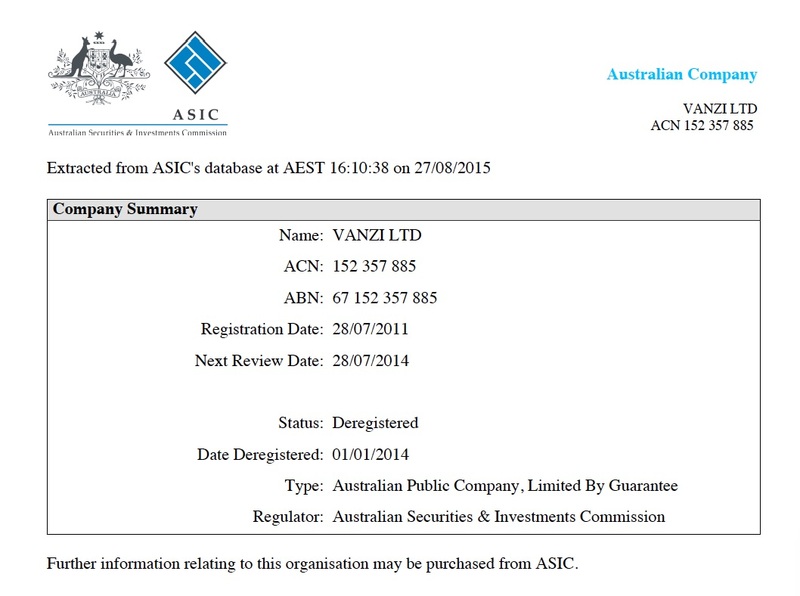 The VANZI Ltd business registrations were cancelled from 22 October that year. 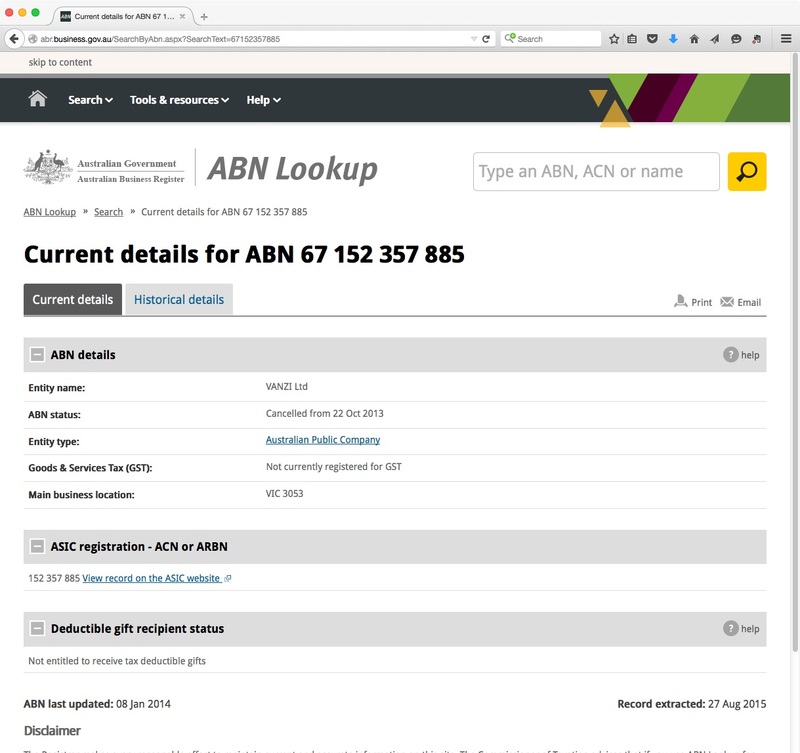 At time of writing (28 August 2015), the VANZI Ltd website, vanzi.com.au, still promotes Michael Haines as CEO of VANZI Ltd and still lists the cancelled ABN number. 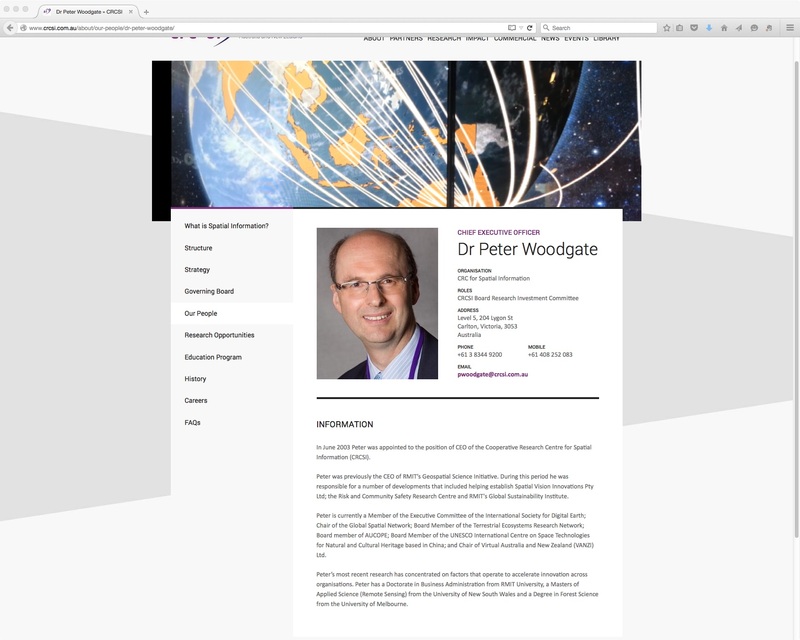 The CRC-SI’s website still promotes Peter Woodgate, on his CEO biography page, as the current chair of VANZI Ltd. However VANZI now is aligned with the Spatial Industries Business Association (SIBA, where it is described as a ‘knowledge community’), and buildingSMART, the international building modelling standards organisation, which was represented on the VANZI Ltd Board by its two Australasian leaders, John Mitchell, then James Plume. They co-operate now to ‘broker a framework for the digital built environment’ – apparently excluding the non-building environmental systems that were part of the originally wholistic Virtual Australia vision. After chairing what we at virtualanz.net promoted as ‘the world’s first Virtual Nations project’, Woodgate and other CRC-SI staff and supporters recently established an Australian chapter of the International Society for Digital Earth (ISDE). Comprising geospatial science researchers developing systems supporting Earth observations and data modelling, the ISDE has appointed a Sydney executive of the CRC-SI, Dr Zaffar Sadiq Mohamed Ghouse, as its Australian chapter president. Woodgate also chairs another new not-for-profit company, Open Digital Earth Foundation Ltd (ODEF), which is working with the Queensland Government to ‘bring the power and benefits of globe technologies, and rich spatial information, to every person in every nation for the benefit of humankind’ (quoting Woodgate’s mission statement on digitalearthglobe.org). It is not clear how the ODEF relates to another CRC-SI project, the Global Spatial Network (GSN), also chaired by Woodgate, which was launched in 2010 with partner research organisations in Sweden, Canada and Korea. However a page explaining the CRC-SI on the GSN website states that by 2018 (when its government funding as a CRC finishes), ‘the transition of the CRC-SI from the CRC Program to a new sustainable entity will be complete’. The ODEF says it aims to find international government customers for the Queensland Globe (Google Earth-based) land uses mapping system – exploiting international interest in QGlobe demonstrations to delegates at the recent G20 governments conference in Brisbane. 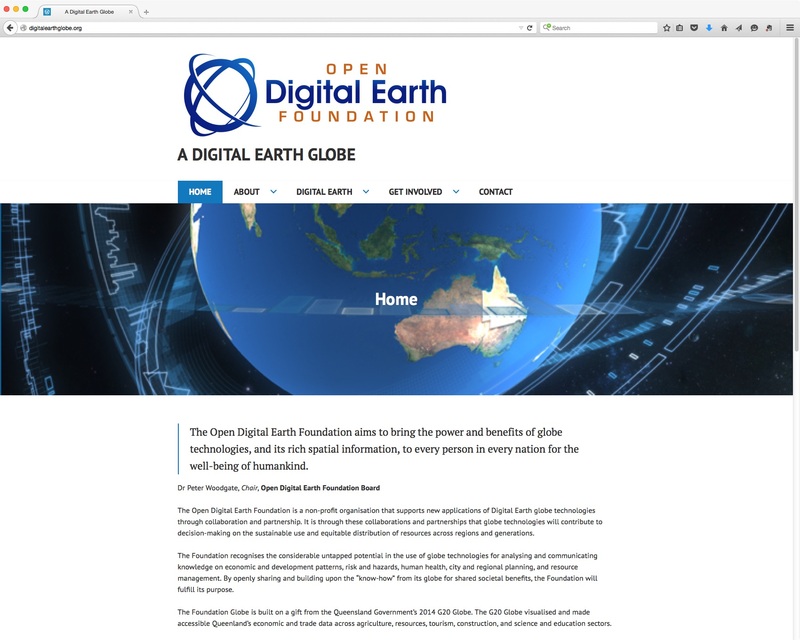 However ODEF adoptions of the Digital Earth term, vision statement and a logo similar to that of the ISDE, have sparked bitter email exchanges among the ISDE’s senior members, objecting to ‘lack of transparency’, ‘lack of consultation’, ‘disgraceful’ empire-building, ‘unauthorised use’ of the ISDE logo to wrongly endorse the ODEF and ‘conflicts of interest’. Some have suggested that Woodgate should resign from his position as an ISDE Executive Committee member. 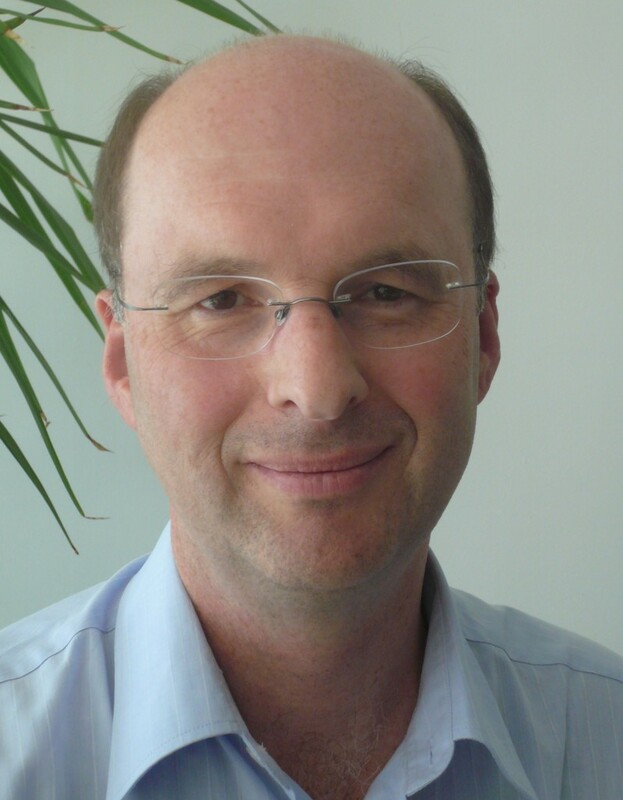 At time of writing, Woodgate is a candidate for the ISDE presidency – following the premature resignation (in June 2015) of the ISDE’s current president, Dr John Richards, a former professor of remote sensing at the Australian National University in Canberra. Richards and Woodgate are collaborating to strengthen both ODEF Ltd and the ISDE’s Australian Chapter, which is bidding to host the ISDE’s 2017 conference in Sydney. Woodgate and Richards have denied the ISDE members’ allegations, in Richards’ letter of resignation as president, and in a joint letter later. Also confusing the spatial simulations scene, beyond Virtual Australia, is the future of NICTA – the national digital research organisation – and its National Map project, launched in 2014. NICTA executives claim that its National Map platform, Cesium, is more advanced and versatile than Google Earth, which is used for the Queensland Globe and the ODEF-proposed G20 Globe. However, the Commonwealth Government is dissolving NICTA – which has not been popular with current leaders and alumni of the CSIRO, including current leaders of the CRC-SI and allied universities. Some of NICTA’s National Map experts have taken new jobs with the University of Technology Sydney (UTS), but the project itself is being merged with digital geography programs at the CSIRO. Michael Haines (31 August 2015): I was CEO of the Virtual Australia and New Zealand Initiative (VANZI) before the company was formed, I was CEO while it was formed and I am still CEO. The VANZI logo is separate to the company. No laws have been broken and no parties have been duped. No one has had the slightest interest in the legal form of the project. Their interest has been and remains in the ideas that the project promotes. The company was formed when it was proposed to offer stakeholders the opportunity to subscribe to the project. This never happened and it was shutdown. International Society for Digital Earth (8 September 2015): The ISDE’s Executive Committee declared Chinese Academician Professor Guo Huadong its new president, after deeming Australia’s candidate, Dr Peter Woodgate, ‘ineligible’. buildingSMART (11 September 2015): Two architect directors of buildingSMART Australasia, John Mitchell and James Plume, were both directors of VANZI Ltd, promoting its vision to ‘broker the framework for the Digital Built Environment’. buildingSMART now claims on its website to be ‘a member of the VANZI organisation, a joint body of leading players in NZ and Australia developing a new digital access methodology for all information in the built environment’, and lists Jim Plume and Michael Haines as contacts. 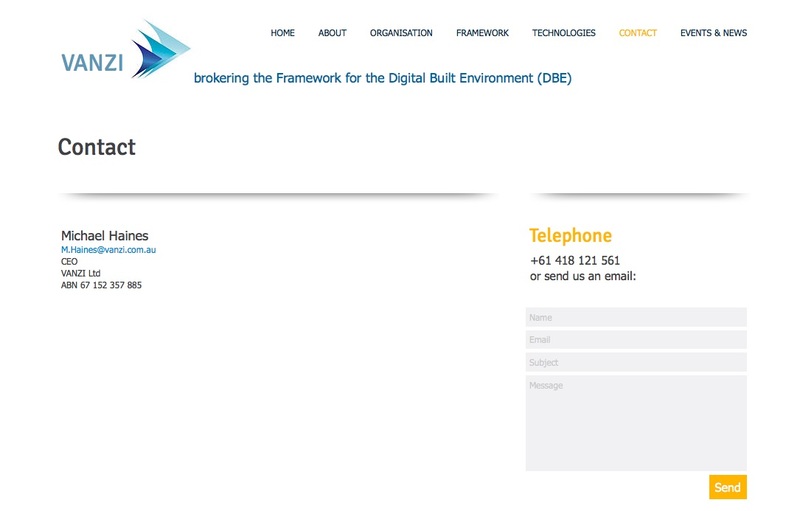 Although buildingSMART lists ‘Regulatory Framework’ as one of its strategic topics, the RF webpage states: ‘We do not have a working group to address the Regulatory Framework topic yet’.